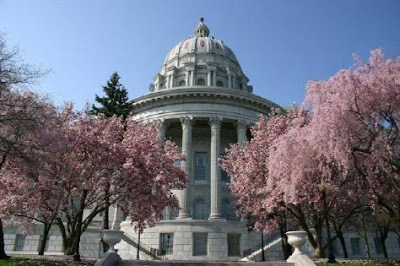 Follow the 2011 Legislative Session on the Missouri Senate website that features live debate, hearings calendar information, bill tracking and more. Federated Republican Women's Club of Lafayette Co. NOTE: All meetings begin at 7 PM and are held at historic Lafayette Hall, 10th and Franklin, Lexington, unless otherwise noted or announced. Open to public as well as members. Prospective new members encouraged to attend. Spouses and friends of members are invited to join as Associates at a reduced membership fee. Refreshments served. March 24--First meeting of the year. Program: Glen Kolkmeyer on "Redistricting". April 28--Program: Linda Niendick, County Clerk, on volunteering at polls. Hostess: Lexington. May 26--Program TBA. Hostess: Corder. June 23--Program: Bob Atkinson on Israel and Palestine. Hostess: Mayview. July 28--Program TBA. Hostess: Odessa. September 22--Program TBA. Hostess: Waverly. October 27--Annual Carry-In Dinner and Candidate Forum. Location TBA. For more information, contact Valeta McGhee, president, at 816-230-5646.